NOTE: these wools are bulky and expensive to ship. Shipping will be charged at actual rate plus $2.00 handling, which may exceed the automated amount in the shopping cart. We will contact you if additional shipping costs are more than $3.00. A more economical carded wool roving, recommended for needle felting. Core fiber is used to fill the inside of felted objects where color is not important. This is very soft and silky wool batting with long, quality staple fibers. A little more 'sheepy' smell than the Bio wool. This high quality, U.S.A grown wool is blended specifically for extra softness and resilience. 30% organic content. OKEO TEK certified Standard 100, guaranteed to be free of harmful or toxic substances. 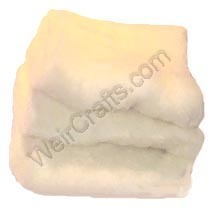 A more economical wool, recommended for wet felting. Core fiber is used to fill the inside of felted objects where color is not important. PREDATOR FRIENDLY: Trained sheep dogs guard the flock. Natural predators are not poisoned, trapped, or shot. HEALTHY VETERINARY PRACTICES: Only certain kinds of medications and supplements can be used to treat the sheep. Sheep raised in open pastures are healthier and require less vet care. FIELDS PROTECTED FROM PESTICIDES: No use of herbicides and pesticides on fields where the sheep will be grazing. Wool is spot tested to ensure that no harmful chemicals have been used. OPPOSE CHEMICAL PROCESSING OF THE WOOL: This wool is not carbonized (dipped in strong acid to dissolve residual matter), dipped (at many farms, sheep are dipped in pesticides), or bleached. SHEEP FRIENDLY: Highly skilled shearing crews trained to shear the sheep with as much care and as harmlessly as possible.